2nd annual In Defense of Water fundraiser was a great success! With the support of our generous sponsors and guests, we raised over $30,000!! Our guests enjoyed fresh, local food from La Prima Catering and beer from Sweetwater Brewing, mingled with Waterkeepers, grooved to the Wendy Steve Jazz Band and bought exciting silent auction items. This year, we honored Nick DiPasquale, former Director of the Chesapeake Bay Program, for his dedication to restoring the Chesapeake Bay and all of its tributaries. Funds rasied this year benefited our Conowingo Dam Campaign. We are working with the State of Maryland to ensure that the water released from the dam meets basic water quality standards. Communities downstream on the Susquehanna River are depnding on us to ensure that the dam operators meet this very reasonable and fair requirement. Every year Waterkeeper Alliance sponsors the SPLASH series of events to celebrate the importance of clean water by providing opportunities to get out on local waterways to swim, paddle, fish, and make a SPLASH! The SPLASH events, sponsored nationally by Toyota, are hosted by local Waterkeeper organizations to engage community members and outdoor enthusiasts in events comprised of water-based recreational activities like swimming, paddling, kayaking, fishing, and much more. Join the South Riverkeeper and the West-Rhode Riverkeeper for a day of swimming, paddling, and celebrating the River! This brand new free event will be held on the South River at Mayo Beach Park, Edgewater, MD. Free admission includes use of kayaks and stand up paddleboards, music, and free beer! Guava Jelly and Swampcandy will be playing! There will be food trucks with lunch available for purchase. What a fantastic Father's Day Treat! Join the Middle Susquehanna Riverkeeper on a 12 mile guided paddle for all ages on the Lower Loyalsock Creek to West Branch Susquehanna River. Kayak rentals available. The day includes catered breakfast by Pier 87, picnic lunch, and catered dinner at Kremser's Landing by ACME BBQ with live music by Susquehanna Jamcrackers. Join the Potomac Riverkeeper for a guided Monuments Memorial Paddle around Columbia Island. Paddlers will enjoy spectacular views of the Lincoln Memorial, Washington Monument, and the Memorial Bridge. The trip concludes at Columbia Island Marina for drinks and refreshments. 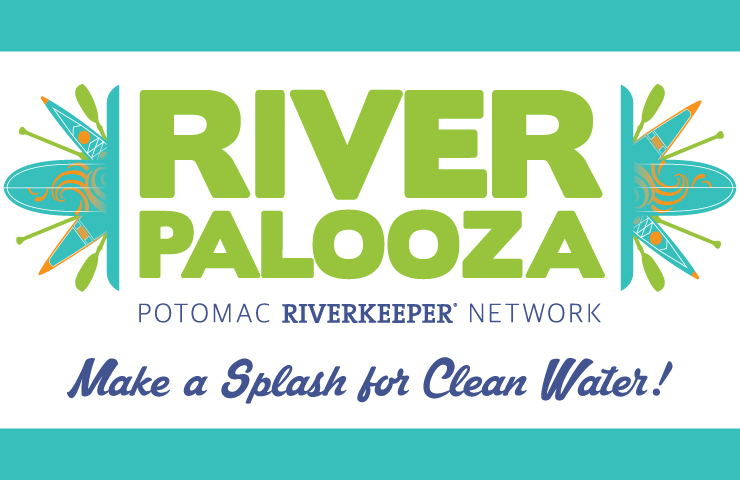 This paddle event is the last in Potomac Riverkeeper Network’s RiverPalooza 2018 series. Join the James Riverkeeper for a guided paddle on the James River in the Richmond area to learn about the return of the Atlantic Sturgeon. More details to come! James Riverkeeper offers guided canoe and kayak programs that connect people to the history and natural resources of the James and its tributaries through outdoor recreation from March until November. Our Waterkeepers are hosting several of other events throughout the year! Check our website calendar for an event near you! We’re super excited to be the recipient of a MOM’s Organic Market 5% Day at the grand opening of their Gaithersburg store June 1 – 3, 2018! MOM’s is an important partner for our work protecting clean water and promoting healthy, organic soils! This is a great opportunity for you to have your grocery shopping dollars support local efforts to protect your clean water and grow local organic farms! Come find us at the grand opening and learn more about your local Waterkeepers and our Fair Farms campaign! Local tastings, kids’ activity, music, activities, giveaways, and much more! P.S. You can support our work directly by making a donation today! March in Annapolis to Stop Fracked Gas Pipeline Under the Potomac! Back in April, Governor McAuliffe put the brakes on issuing coal ash solid waste permits to Dominion for at least a year so the toxic coal ash threats posed at their facilities can be assessed and the full range of disposal solutions explored, including recycling. This assessment will be presented to the State Water Commission on December 4th. Please join us Dec. 4th from 10:00 – noon to hear the results of this finding. The meeting will be located in Virginia State Capitol, House Room 1, 1000 Bank Street, Richmond, Virginia. Remember to bring a state issued ID to gain entry into the Virginia State Capitol. Immediately following the meeting there will be a press event and a Dominion: Move Your Ash rally. RSVP today to receive updates. We need to tell Dominion and Virginia loud and clear that they can’t bury toxic coal ash in leaky ponds at their power plants! This rally and concert will focus attention on the Virginia Water Control Board hearings coming up in Richmond on December 6, 7, 11 & 12 to decide whether or not to grant water quality certifications for the Atlantic Coast and Mountain Valley Pipelines. The Rally & Concert on Dec. 2nd and the public hearings represent the last political chance in Virginia to stop these fracked gas pipelines. Help surround Capitol Grounds from 1-2pm to send a strong message to our public officials. Then join for food, fun, and music at The National. WHERE: 1:00 pm at Capitol Grounds in Richmond and 2:00 pm at The National. The Virginia State Water Control Board will hold hearings to consider the application for water quality certification for the Atlantic Coast Pipeline. The consideration is part of the process required under Section 401 of the federal Clean Water Act. The meetings are scheduled for: 9:30am, Monday, Dec. 11 and Tuesday, Dec. 12 at Trinity Family Life Center, 3601 Dill Road, Richmond, VA. The Water Control Board is the last hurdle Dominion faces in Virginia, and our last hope to block it before heading to federal court. Help us send a message to the Board and Governor McAuliffe – come out to the hearings on December 11 & 12 and demand they put Virginians and our environment ahead of national politics and Dominion influence-peddling. Check our Facebook page for updates. The Maryland Department of the Environment (MDE) is holding a public meeting on TransCanada’s proposed fracked gas pipeline that would tunnel under the Potomac River. The hearing is Tuesday, Dec. 19th, 6:00 – 9:30 pm at Hancock Middle/High School, 289 West Main Street, Hancock MD 21750. At this meeting, MDE will hear from Marylanders to inform their decision about whether to approve or deny the 401 Water Quality Certification under the Clean Water Act. Denying the 401 permit would stop the construction of this pipeline in its tracks, and is the best way for Governor Hogan and MDE to protect our drinking water! Join us on Dec. 19th to stand united in saying NO to the Potomac Pipeline. This is a critical moment to stop the Potomac Pipeline, show up and speak up! Please support our work to defend and protect your clean water! Join your Upper Potomac Riverkeeper, along with neighbors and the brave defenders of the Potomac watershed on November 5th in Chevy Chase, Maryland from 7-10pm at the Meadowbrook Park Activity Building. We will celebrate and learn about our unique watershed and a small community's fight against a large hog Concentrated Animal Feeding Operation (CAFO) in Fulton County, PA. This factory-like facility would be the largest in the county and would house close to 9,000 hogs, while confining sows to production of 9,600 piglets each month – or 115,200 piglets annually. With this many pigs comes even more manure. The CAFO would apply over 11.4 million gallons of manure to land in our watershed and use an estimated 14 million gallons of water each year. Our upstream neighbors and community members, led by homeowner Marjorie Hudson (pictured below) - who lives across from the proposed hog CAFO - have opposed the project since it was proposed in 2014. Thanks to their efforts, they have been able to stop the CAFO from polluting nearby air, land and waterways. The location of the proposed CAFO is on a hill that drains into tributaries of Big Cove Creek, a popular fishing location. The waters of Big Cove Creek flow into Licking Bend Creek, which is a tributary of the Potomac River. The Potomac River flows into the Chesapeake Bay and provides drinking water for approximately 4.5 million people. Marjorie and her neighbors can't go it alone - they need our support! Please join us in support of Marjorie’s life-sustaining work because we all live downstream. RSVP & DONATE on EventBrite or Facebook! Pollute groundwater and drinking water aquifers, as manure will be spread in a Karst area. Some Karst features are springs, sinkholes, and underground streams. Not only do hog CAFOs create harsh odors for neighboring communities, but they also emit toxic pollutants, like hydrogen sulfide and ammonia, that can cause serious health problems for residents. Children and other vulnerable populations are more likely to experience asthmatic symptoms near hog CAFOs. Unlike other industries, hog CAFOs are not regulated by the Clean Air Act. Runoff from hog CAFOs contains microbes, hormones, pesticides and other harmful chemicals that degrade water quality, kill fish, cause algal blooms, and impairs drinking water sources. CAFOs and other agricultural operations are responsible for 80-90% of all water consumption, using 34-76 trillion gallons of water every year. Just one CAFO with 800,000 pigs generates 1.6 million tons of animal waste every year. This is as much waste is 1.5 times the amount of waste produced by the city of Philadelphia! Unlike human waste, animal waste from hog farms is often left untreated in open lagoons. This waste also contains harmful microbes and hormones, that make their way into local waterways. ‘We Are All Downstream’ is dedicated to the memory of the late Kathy Ozer who for 24 years tirelessly advocated for small family farms as Executive Director of the National Family Farm Coalition. Waterkeepers Chesapeake Board Chair Bob Gallagher is opening his home for the 1st annual In Defense of Water event to benefit Waterkeepers Chesapeake. Thanks to Bob, the Host Committee and you, Waterkeepers Chesapeake will raise much needed funds for the protection of clean water throughout the Chesapeake and Coastal Bays region. We're excited to have special guests Heather and Deborah Mizeur and great local food from La Prima Catering! Questions? robin(at)waterkeeperschesapeake.org. As a designated 501(c)3 Maryland-registered charitable organization, your contributions are tax-deductible. The 2017 season of Waterkeeper Alliance SPLASH events will take place on waterways across the United States. The series supports local Waterkeeper organizations by engaging community members and outdoor enthusiasts in events comprised of water-based recreational activities like swimming, paddling, kayaking, fishing and much more. In addition to several SPLASH events in our region, our Waterkeepers offer other on-the-water experiences. Check them out! RiverPalooza runs through the summer and offers 14 paddling and on-the-water events with Potomac Riverkeeper Dean Naujoks, Shenandoah Riverkeeper Mark Frondorf and Upper Potomac Riverkeeper Brent Walls in partnership with the National Park Service and the region’s best outfitters. RiverPalooza 2017 kicks off on June 3rd with Make a SPLASH for Clean Water Dayat Harpers Ferry — including paddling, rafting, tubing and a big party with BBQ and a bluegrass band. Several of the paddle trips go along the Captain John Smith National Historic Trail and the Potomac Heritage National Scenic Trail. They will wrap it all up with a Stand Up for Clean Water Celebration on September 24th, to recognize World Rivers Day and the 45th Anniversary of the Clean Water Act. Proceeds of RiverPalooza benefits Potomac Riverkeeper Network. 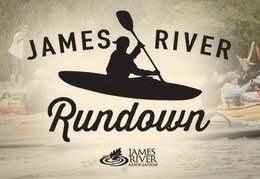 Join Upper James Riverkeeper Pat Calvert and and Lower James Riverkeeper Jamie Brunkow for the James River Rundown, a series of canoe, kayak, and SUP races running through the heart of Virginia on the scenic James River. The James River Association is organizing a two-day 120-mile race, 50-mile race, 25-mile race, and 5-mile fun float for this year’s event. Competitors will race through weather, natural features, and fatigue to reach the finish line at Goochland County’s Tucker Park. A post-race celebration featuring food, beverage, live music from Sturgeon City, and programming offered by L.L. Bean Outdoor Discovery Schools will be held at Tucker Park on Sunday, June 25th. Proceeds from the James River Rundown support the Upper and Lower James Riverkeepers. On Saturday, June 24, join Miles-Wye Riverkeeper Jeff Hortsman, Choptank Riverkeeper Matt Pluta and the Talbot County Chamber of Commerce Young Professionals for the Tred Avon Paddle-Jam that brings paddling and poker together! Paddlers will launch kayaks, canoes, or paddleboards from Easton Point Marina to enjoy a six-mile paddle on the Tred Avon River. Along the paddle route, paddlers can pick up poker cards and the winning hands receive prizes. Paddlers will end back at Easton Point Marina, where there will be live music, food trucks, beverages, and great prizes. Proceeds benefit Midshore Riverkeeper Conservancy. 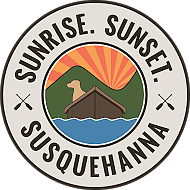 Join Middle Susquehanna Riverkeeper Carol Parenzan and show your love for your ‘Hanna on Saturday, July 22, at the Second Annual Sunrise Sunset Susquehanna Paddle & Play at Susquehanna State Park in Williamsport. Adventurous river rats will start their day with an 11-mile paddle on the West Branch with their Middle Susquehanna Riverkeeper, launching near Lock Haven and landing at the state park, to be treated to an afternoon of riverside music, storytelling, interactive environmental education, regional foods, and family-friendly activities. End your day with a cruise aboard the Hiawatha Paddlewheel Riverboat as we travel on the Mighty Susquehanna to engage in bird watching and river reflecting. More On the Water Events! Our Waterkeepers will have more events throughout the summer and fall months so check our calendar as we continue to add events. What an amazing weekend in DC! 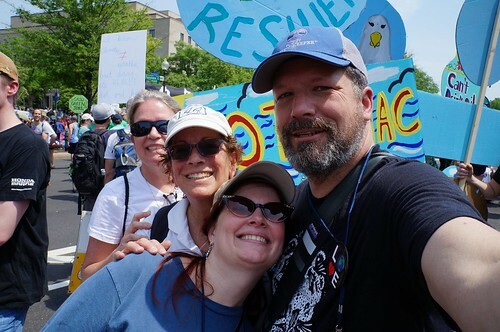 Thanks to the weeks of preparation by local Riverkeepers, artists and spiritual women, the Waterkeeper movement had one of the best presentations at the People’s Climate March. 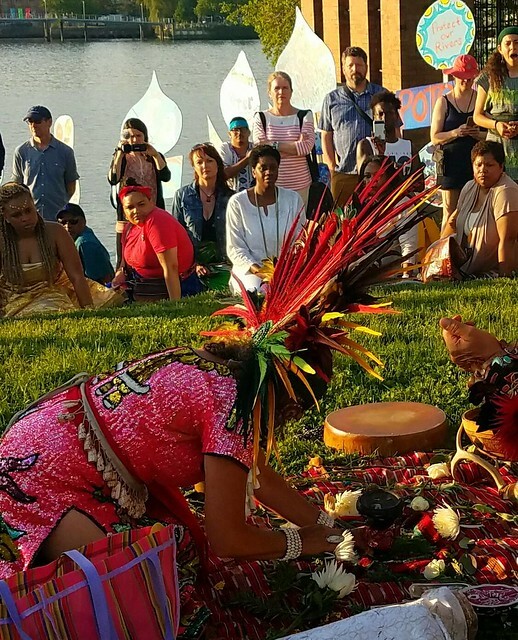 In the weeks before the March, Potomac Riverkeeper Dean Naujoks, Anacostia Riverkeeper Emily Franc, Patuxent Riverkeeper Fred Tutman and Waterkeepers Chesapeake joined Spring of Light and EcoHermanas at sacred water ceremonies on 3 Saturdays in April. The public was invited to participate in cooperative art-making led by visual artist Caryl Henry Alexander. Blue totems were created to represent the stories of our local rivers and the spirit of the water at the People’s Climate March. On the eve of the march, the 30 totems were brought to the culminating Honoring Our Sacred Waters ceremony and festival on the banks of the Anacostia at Poplar Point. Waterkeepers from across the region and nation brought water that was joined together for a moving and inspirational blessing of the waters ceremony. The water collected represented waters from as far away as the Cook Inlet in Alaska and the Puget Sound. Rabiah Al Nur of Spring of Light and Linda Velarde, a curandera from New Mexico, traveled on Anacostia Riverkeeper’s boat across the river gathering water along the way. Penny Gamble-Williams opened the circle with a Wampanoag wind blessing. Coracão Dance Collective, a local African dance group, performed a dance in honor of water. Then Linda joined her husband Guillermo in an Aztec dance and Rabiah led a circle dance. The evening closed with an amazing light display from the Detroit Light Brigade. Over 200,000 people marched in the People’s Climate March in DC. As part of the Water Protector section of the march, the Waterkeepers were a sea of blue, with the 30 totems and a huge Great Blue Heron from Assateague Coastkeeper. The visual display was very effective in connecting what we all hold dear -- clean and ample water resources -- to the climate movement. In addition, our Spring of Light and Ecohermanas partners brought our water to the march to be joined with waters from across the nation and world. The water ceremonies and the march were beautiful, hopeful moments. We are grateful to our local partners for sharing their commitment to building community and healing our waters at this critical time. We look forward to future collaborations. We thank Shelby Kalm of Waterkeepers Chesapeake and Sonia Keiner of Patuxent Riverkeeper for taking the lead in planning the events with our partners. Together, Waterkeepers will work with our local communities, Indigenous Nations, workers, faith communities, NGOs, and many others to resist the federal administration’s attempt to roll back clean water protections, and to build a clean water and clean energy future that works for everyone. Chesapeake Waterkeepers Join Peoples Climate March from Sandy Cannon-Brown on Vimeo. Of all the wonders that make the earth our favorite planet, clean water is the most beautiful and vital source of life. Anyone who appreciates beauty can appreciate the Chesapeake Bay, and the need to protect its habitats. We have partnered with glassybaby, a small business that creates gorgeous, hand-blown votive candleholders in hundreds of colors and donates 10 percent of all sales to help people, animals, and the planet heal. One of glassybaby’s newest colors, named “chesapeake,” is inspired by the beauty of the Bay. On each sale, 10 percent of the proceeds of ‘chesapeake’ will be donated to Waterkeeper’s Chesapeake to support the work of the 19 Waterkeepers from around the Chesapeake. You can get your glassybaby votive at the upcoming glassybaby pop up show. 10 percent of sales from this event will be donated to Waterkeepers Chesapeake. Can’t make it? Between April 25 and May 2, visit www.glassybaby.com to order. Please enter giving code ‘waterkeepers’ to receive free shipping (10% of your online order will be donated to Waterkeepers Chesapeake).